Virtualization is great. It does stress the systems more than non-virtualized environments, but it does give you far more options than normal on how to solve a problem. Today I was caught in one of those self-aware moments and marvelled at what I was actually doing. On top of the obligatory 10 IE windows that always seem to open up, I'm currently installing Visual Studio onto a new virtual machine so that the dev environment will be portable between reinstalls. That was taking a while so I had also started downloading the latest patch for the backup application, as well as backing up the old local VMs to a USB caddy HDD. The big thing today though will be the Library Catalogue server move. After trying to get a proxy in place so that the library catalogue could be visible from outside the school, we've eventually caved in to giving it it's own external interface. Instead of opening up the virtual host for the library catalogue, we're going to try to move the virtual machine from one virtual host to another that already has an external interface card already in place. This will also free up a virtual host for other emergency work later if needed. To get started on the move I've also opened up another IE window with the 4 VH servers on different tabs (opening directories-at-once in IE is awesome). from here I can check out the status of each virtual machine and shut down LC01 for the move. 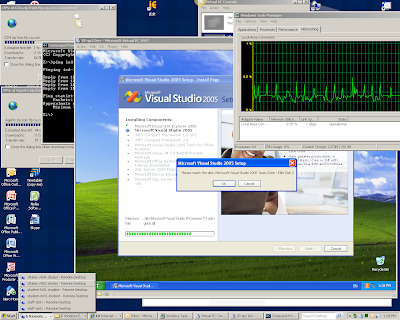 I've also set up 2 remote desktops to the 2 virtual hosts to move the VM file to its new location.